Name of several Biblical personages. It has two forms— and —and its meaning is "He is my God," i.e., "He remains my God and does not change," not as G. Hoffmann ("Hiob," 1891, p. 23) renders it: "He is my God," i.e., "My God is the only true God." The most famous bearer of this name is found in the Book of Job (xxxii. 2-6, xxxiv. 1, xxxv. 1, xxxvi. 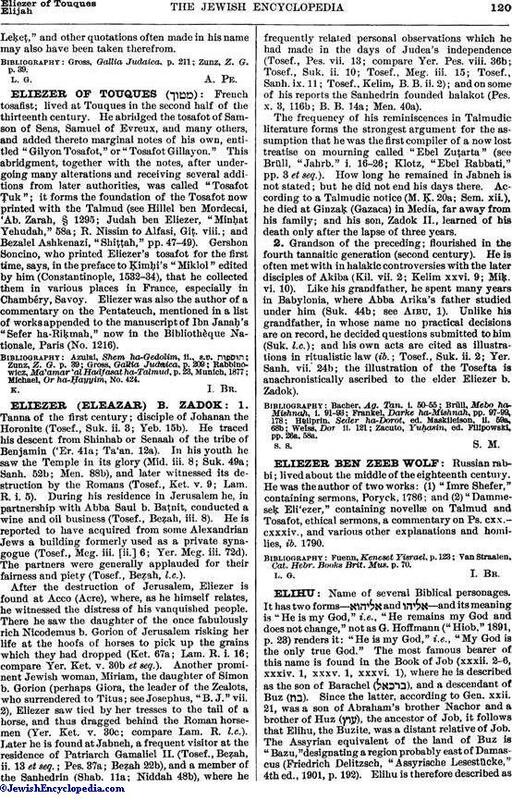 1), where he is described as the son of Barachel ( ), and a descendant of Buz ( ). Since the latter, according to Gen. xxii. 21, was a son of Abraham's brother Nachor and a brother of Huz ( ), the ancestor of Job, it follows that Elihu, the Buzite, was a distant relative of Job. The Assyrian equivalent of the land of Buz is "Bazu," designating a region probably east of Damascus (Friedrich Delitzsch, "Assyrische Lesestücke," 4th ed., 1901, p. 192). Elihu is therefore described asa non-Israelite living during the patriarchal period, like Job and other personages of the book named after him. Elihu is the speaker in ch. xxxii.-xxxvii., and his argument is as follows: God is the educator of mankind, who punishes only until the sinner has atoned for his sin and recognizes his wrong-doing. Then God has attained His object, to "bring back his soul from the pit, to be enlightened with the light of the living" (xxxiii. 17-30). Elihu, therefore, holds a middle ground, maintaining that God neither "takes away judgment," nor sends suffering merely as a punishment, but acts as the educator and teacher of mankind (xxxiv. 5; xxxv. 1, 14; xxxvi. 10, 22). 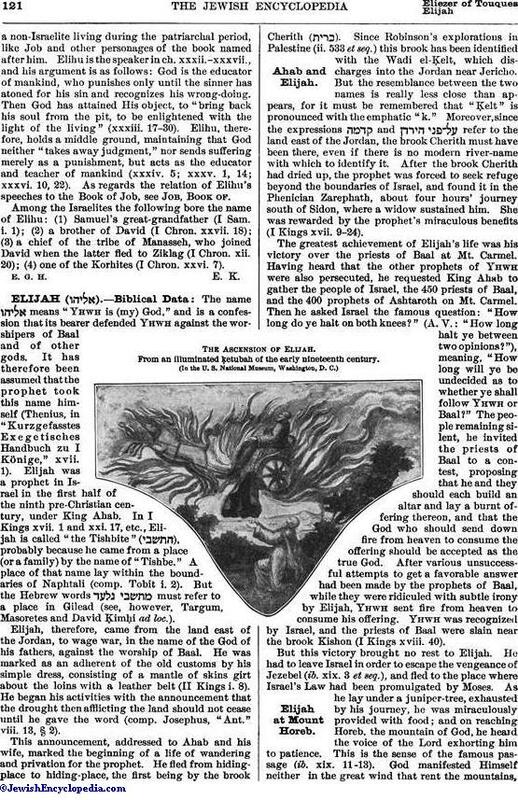 As regards the relation of Elihu's speeches to the Book of Job, see Job, Book of. Among the Israelites the following bore the name of Elihu: (1) Samuel's great-grandfather (I Sam. i. 1); (2) a brother of David (I Chron. xxvii. 18); (3) a chief of the tribe of Manasseh, who joined David when the latter fled to Ziklag (I Chron. xii. 20); (4) one of the Korhites (I Chron. xxvi. 7).